I don't know about you guys, but when it comes to fitness, supplements make a huge difference for me! I don't take a ton of them, but the ones that I do use, I absolutely love! Now just to let you know, I am not sponsored by any of these supplement companies, I just genuinely love them! Right now, my favorite pre-workout is the Cara Loren Prenatal Pre-Workout! I love nursing my babies, but I also love having the energy to workout. This pre-workout is nursing friendly, so I am able to take it! It gives me the perfect boost and I couldn't recommend it more! As for the flavor, it really isn't bad at all, but I am just not a pink lemonade person. I love IdealLean Proteins because they are made specifically for women! They are lower in calories than most proteins, but still have 20 grams of protein per serving! They also taste amazing! My favorites are chocolate brownie, chocolate coconut, and caramel mocha. I just got their limited edition peanut butter chocolate too, which I am excited to try! I swear by BCAAs! I know people have different opinions on whether or not they work, but for me they definitely do. The Xtend BCAAs have the 3 branch chain amino acids that help to maintain and build muscle, which are leucine, isoleucine, and valine. I feel that I have more endurance during my workouts when I take them and can exercise for longer without becoming fatigued. On top of this, the flavors are amazing! I love green apple, blue raspberry, and tangerine! What supplements do you love?! 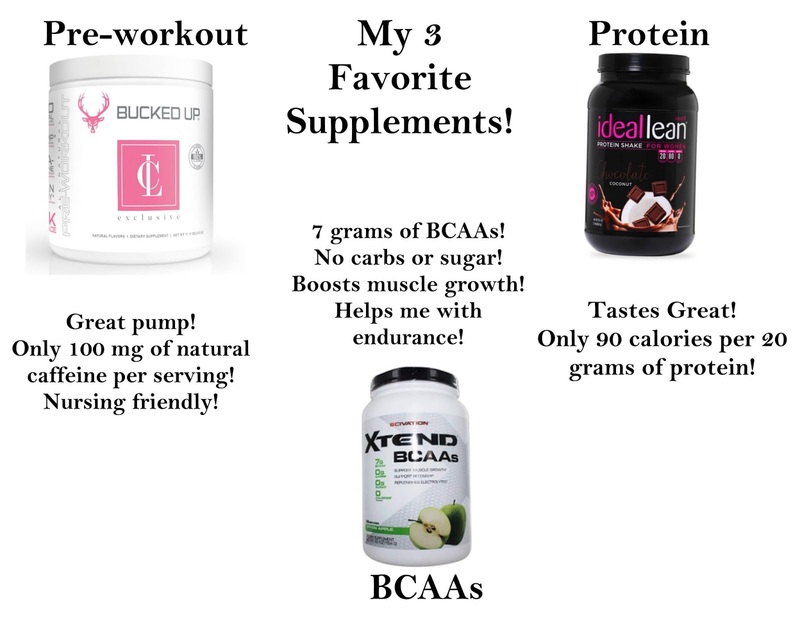 BCAA’s are the best! I tried to get the blood orange and they discontinued it or something. Lame!! You look great and I love your outfit! What!? Are you sure they just aren't out of stock? I'd be so sad! And thank you! Love you! So do you take the protien after working out and the BCCAS before?